Getting IPSec VPN connectivity between two devices is always a painful experience, somewhat akin to a root canal. So I eventually roused up the courage and decided to try and get Android 4.x native VPN to connect to a Cisco 877 at home. A few four-letter words and some blasphemy later, I finally had success! The below example should help anyone else having problems getting this working. A Cisco 877 running 12.4(24)T1 (advanced IP services), attached to an ADSL line on the public side, with a LAN in RFC1918 space internally. A simple NAT configuration is configured between public and private. An Android phone (in my case a galaxy S3 running 4.1.2 stock) with a 3G SIM. My carrier runs CG-NAT yet the setup still works. IPSEC PSK - A shared secret (key) for the Ipsec/ISAKMP session. L2TP username - A username for the L2TP layer of the session. L2TP password - A password for the L2TP layer of the session. Pool addresses - Range of (RFC19218) IP addresses to assign Android VPN endpoints. Ideally unused addresses in the LAN subnet.
! Enter L2TP username and password below.
! Enter IPSec preshared Key below.
! Use your public WAN interface.
! Below, specify the internal LAN interface.
! Specify the first and last IP address to assign. Name: a convenient name for the connection. Doesn't have to be related to anything above. Server address: The WAN address of the Cisco router. IPSec pre-shared key: The IPSEC PSK from above. DNS search domains: Leave blank. Forwarding routes: The LAN subnet per above. Select the connection you created. Enter the L2TP username and L2TP password from above. After a while, the connection status should show as Connected and things should work. IPSec rarely comes up first time, there's often some tweaking to be done in order to make the protocol(s) happy. Debugging can help narrow down where the problem lies. .Aug 3 22:39:56: ISAKMP:(0): Failed to construct AG informational message. .Aug 3 22:39:56: ISAKMP:(0):Sending an IKE IPv4 Packet. .Aug 3 22:39:56: ISAKMP:(0):peer does not do paranoid keepalives. This generally means that the parameters in the 'crypto isakmp policy 1' statement dont match what the phone offers. The preceding messages will show what was received from the phone - you need to ensure the Cisco is configured with one of these. .Aug 3 22:43:27: ISAKMP: reserved not zero on ID payload! This tends to indicate a mismatch of the pre-shared key. Be sure that they are the same. .Aug 3 22:46:46: ISAKMP:(2046):atts are acceptable. This is generally indicative on a problem at the next layer. Enable debug l2tp error for messages at the nest layer. If this still doesnt solve the problem, then debug ppp authen and debug ppp error can track them down further. 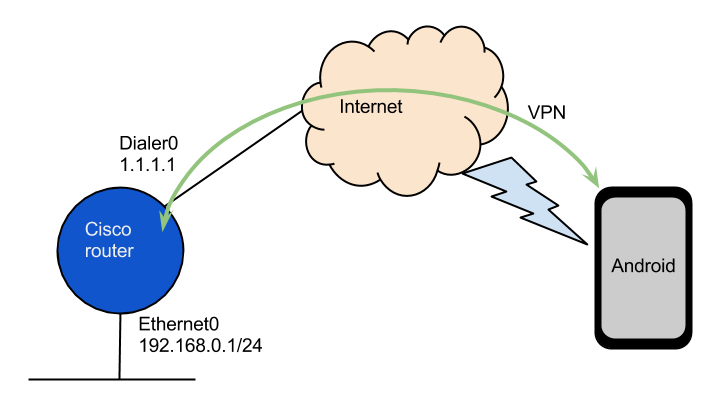 If you find that short data connections get through but not large ones (eg web pages return partially complete), then its likely you have a MTU problem. In the Virtual-Template1 configuration stanza, try changing the MTU from 1398 down to 1300 or even 1200. Other MTU optimisation strategies exist, but are beyond the scope here. Could you possibly me a sample configuration of a Cisco 877 with IPSec Xauth send-PSK. What would change as opposed to your config, or added. And one of the many benefits of the virtual private network is to get more information about VPN at itday.com. that it ensures that a right amount of security to all the systems that are connected when the infrastructure present alone cannot provide that. My experience of connecting a native Android VPN to a Cisco Router was also a painful one and that’s why I got best free VPN with help of hidemyass vpn review online. It actually worked for me and I recommend it to everybody in need. Android VPN's aren't just for mobile phones The Android OS powers more than just mobile phones. You'll also have your choice of tablets and notebooks. An Android best VPN for torrenting will give you an extra layer of security to get things done without worrying about revealing personal information.